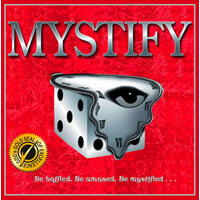 Find out how fast your mind works as you play the exciting party game of Mystify. Race against your opponents to solve scrambles from five different card categories. The categories could include: places, names, numbers, and more. After the timer is started players start trying to find the answer. Clues are there to help the players find the answer. Possible clues include whether it's a first name, animal, place, object, or date. Players can blurt out a guess at any time, but only one guess is allowed. Make sure you guess right the first time and check out Mystify today! To win the game of Mystify players must race to solve Scrambles and move around on the game board. The first player to reach the finish space wins Mystify. Your Mystify board game should come with a game board, 360 scramble cards, a sand timer, pawns, pencils, and the Mystify game rules and instructions. Please keep in mind that the official Mystify party rules and instructions could be different depending on the game version you have. The rules below are some of the exact directions on how to play Mystify. Share with us your comments, funny stories, tips, advice, strategies, creative ways to play, questions about how to play, problems with the rules or anything you want about Mystify. All submissions will be reviewed within 24 hours. Click here to add your Mystify comments.